The top seven vertebrae that form the neck are called the cervical spine and are labeled C1-C7. The lower back, or lumbar spine has five vertebrae, labeled L1-L5. The sacrum and coccyx (tailbone) are made up of nine vertebrae that are fused together to form a solid bone. 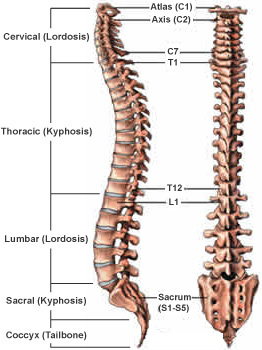 The sacrum is labeled S1.